"The fact that you can feel the concussion against your legs was crazy," said Kathleen Staab, who watched from about a half-mile away. "Whoa!" the crowd shouted. "Do it again!" The structure has already been replaced by the Gov. Mario M. Cuomo Bridge, which carries Interstate 87 traffic between Westchester and Rockland counties, about 30 miles (50 kilometers) north of New York City, at one of the broad Hudson River's widest spots. The new bridge, which parallels the old one, was closed to traffic during the demolition. "My boss let me go," said Catherine Easton, 56. "I was going to make up a story, but I decided to tell the truth." Easton, 56, drove from Redding, Connecticut, with her boyfriend. "We saw our first fireworks together with the bridge in the background," she said. "So we have a sentimental thing with the bridge and we wanted to wish it goodbye." Staab, 45, of Sussex, New Jersey, went there with her sons, ages 10, 7 and 4. "They're playing hooky," she said. "I'd rather them experience history than read about it." She said, "It was always a neat bridge to drive over, and the views were always so beautiful. But it is always kind of sad to see a piece of history implode." 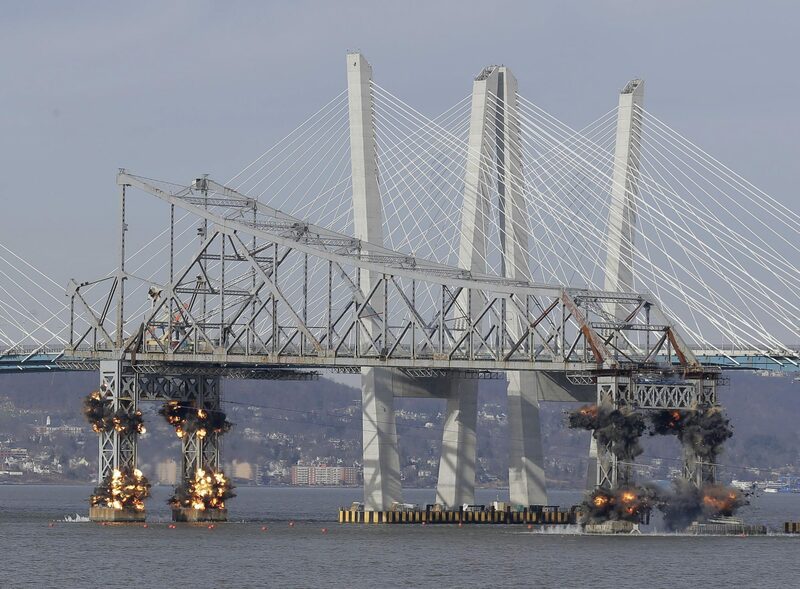 The Tappan Zee Bridge, which opened in 1955, became a poster child for America's crumbling infrastructure. Gov. Andrew Cuomo, the son of the new bridge's namesake, recalled in 2017 an experience familiar to many Tappan Zee drivers — steel plates that shifted beneath traffic, providing unnerving glimpses through road cracks of the chasm below. The Democrat said he'd envisioned escape scenarios in case he ended up in the water: "'Do I take off the seat belt? Do I open the window?' I had one of those special tools with the hammer and the seat belt cutter." "I think it traumatized an entire generation," he said. Cuomo watched the demolition by video at the Capitol in Albany. "Boy, it went straight down," he said as his Cabinet members applauded. This story has been corrected to show that the demolition happened Tuesday, not Thursday. Copyright (2019) Associated Press. All rights reserved. This material may not be published, broadcast, rewritten, or redistributed. This article was written by Rebecca Gibian from The Associated Press and was legally licensed through the NewsCred publisher network. Please direct all licensing questions to legal@newscred.com. How Can An Overturned Train Lead To Better Earthquake Hazard Predictions? Would You Fly on a Plane Without a Human Pilot?